This dish is prepared with an inspiration from the Chinese cuisine. I did add a twist with an extra ingredient i.e. an orange in the recipe. 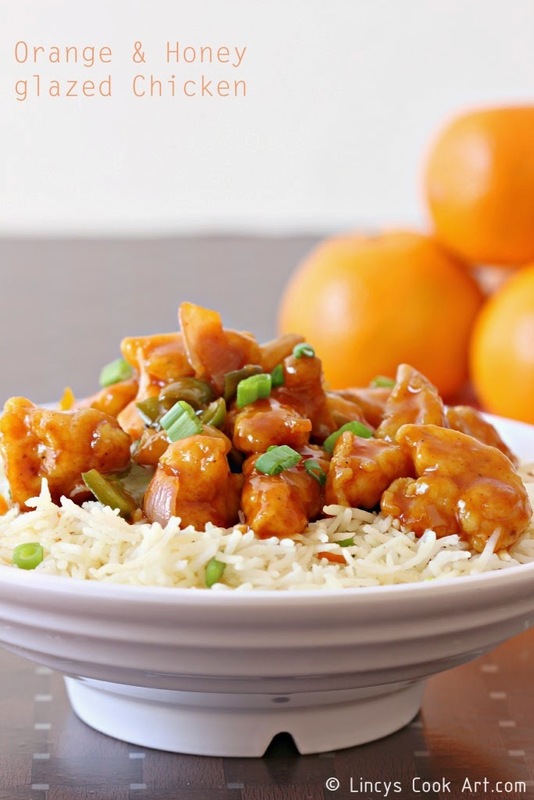 It is a sweet and spicy dish; the orange adds complimentary flavor and zingy palate to this chicken dish. Nowadays i am keep on experimenting many Chinese dishes. Today i wish to share with you one such experiment happened in my kitchen which turned out really tasty. Tastes same like a Chinese dish but with a different dimension the orange frutty flavour. In a broad plate mix together all purpose flour, corn flour, baking powder, orange zest, pepper and salt. Mix the chicken cubes and allow them to coat well in the flour mixture. In a broad pan heat a table spoon of oil and shallow fry the floured chicken by shaking off the excess flour. You could deep fry them too. In another pan add 3 teaspoons of oil and add the cubed onion, garlic and green chillies and sauté for a minute. Add the cubed capsicum and cook in oil, till blisters starts to appear on the capsicum skin. Now add the chilli powder and soya sauce and cook for fifteen seconds on low flame till the raw flavour of chilli leaves. Add the orange juice, honey and bring the mixture to boil. Once it starts to boil dissolve the corn flour in 2 tablespoons of water or orange juice and pour over the sauce. Now the sauce starts to thicken and get a shiny glaze. Switch off the gas and sprinkle spring onion and sesame seeds. You could make this same dish as dry semi dry and gravy type by reducing the consistency of the sauce. This dish is a good accompaniment with any type of fried rice or plain basmati rice.